The 'Sarah Josepha Hale' Dress and other designs! I am finally past my first big show, and now I have had the time to put some new designs on the internet! The first is a dress I'm excited about- the 'Sarah Josepha Hale' Dress. You can find more information about this dress on its' product page. But for now, here are the pictures! I am very pleased with how well the pictures show the details of the dress. 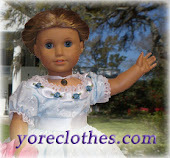 And here is another outfit- the 'Louisa May Alcott' Dress. More information is on its product page. And moving through time to the Great Depression is a dress that was inspired by the Shirley Temple movie, 'Rebecca of Sunnybrook Farm'. More information can be found Here. And, finally, we have arrived in the 1940's with the new 'Home Front' Outfit. More information can be found Here. Firstly, I apologize for the lack of posts in the blog recently. I have been very busy getting ready for one of my big annual shows. This Saturday I will be at Olde Salem Days all day in my booth. If you live in the Salem, Virginia area, be sure to stop by! If you don't, it is a huge craft fair that is worth the trip!